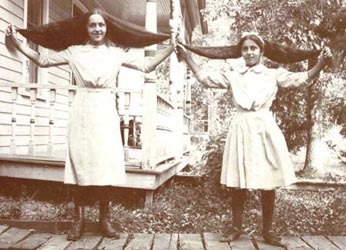 These are photos of my Great-Aunts Adaline Tagatz and Laura Tagatz. 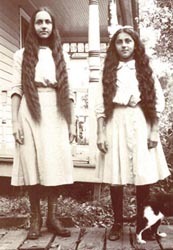 Laura (on the right) died at age 20 in 1921. As a child, I lived in Marquette and Green Lake Counties, Wisconsin. At least 38 of my ancestors lived all or part of their lives in these counties (those individuals are listed below). Most have roots in Prussia, but some came from Massachusetts, New York and elsewhere. One ancestor in Germania - Henrietta Jones - is descended from a line connected to royalty. See William Jones for information about his wife's royal line. Click here for links to surnames and individuals featured on this website. To see a summary page of my ancestors, go to my ancestors. For photos of my ancestors, their friends and the communities where they lived, go to the photo index page. I've tried to use the spelling of names that I found in original sources, and those spellings are often inconsistent -- sometimes spelled different ways in the same record. Although I've done my best to be accurate, I may have made transcription errors.